I recently returned from an extremely rewarding residency at Harvard University with Talea Ensemble which culminated in a concert at Paine Hall on February 27th. All of the graduate composers whose compositions I performed (Hannah Lash, Bert Van Herck, Sivan Cohen Elias, Trevor Baca) were an absolute pleasure to work with. My most memorable experience from this past month with the Harvard folks, both by its tremendous challenges and incredible rewards, was rehearsing and performing Trevor Baca’s Lidércfény, for flute, violin, and piano. Trevor’s input on the piece was inspirational, and I was pushed to grow as a musician in ways I did not think possible. 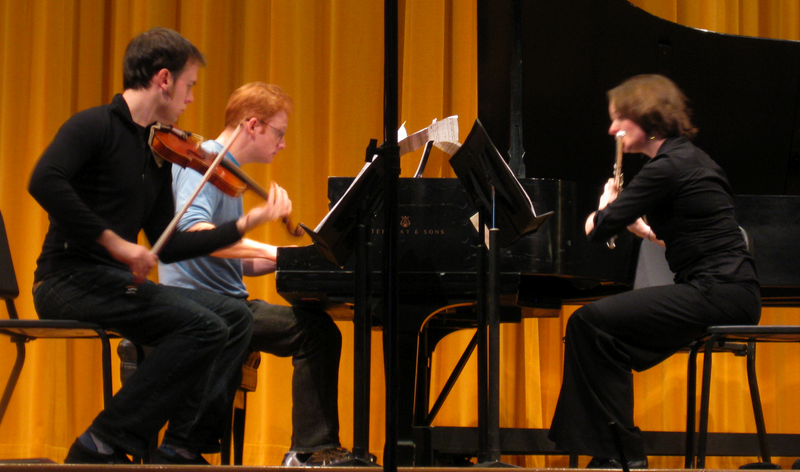 It was also a distinct honor to perform with Elizabeth Janzen on flute and Steve Beck on piano. Please check out this wonderful review of the performance by Piraye Yurttas.